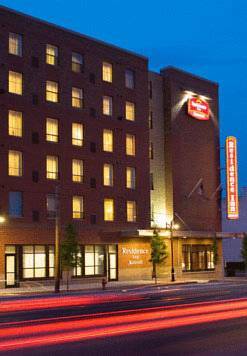 Settle into oversized suites at Residence Inn Louisville Downtown. Located in the heart of the city, we are within walking distance of popular destinations including KFC Yum! Center, 4th Street Live and Louisville Slugger Field, as well as Kentucky International Convention Center and a variety of local restaurants. Throughout your stay, take advantage of on-site amenities including complimentary Wi-Fi and a free, hot breakfast buffet featuring a wide selection of morning favorites. During downtime, work up a sweat in our 24-hour fitness center or take a refreshing dip in our indoor pool. After a long day, head up to our pet-friendly suites and make yourself comfortable with your very own fully equipped kitchen, ergonomic workspace and plush bedding. Hosting an event? Reserve one of our three flexible meeting spaces featuring high-tech AV equipment and dedicated event planners. Book a suite today and see why we're one of the top hotels in Downtown Louisville! A scaled-down limestone carving of Gus's Gemini spacecraft, not the Mercury spacecraft that he sank, or the Apollo spacecraft that killed him.